Bridget Newman our Librarian-- Hi! Ms. Bridget here! 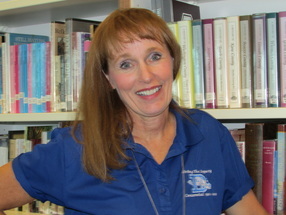 I am in my 20th year of teaching at DIXIE HIGH as your Library Media Coordinator. I would not want to be anywhere else. Our students at Dixie are the VERY BEST and BLEED BLUE when they READ & STUDY! I encourage staff, parents and students to use all the resources in your Library Media Center...YOU BELONG AT YOUR LIBRARY! Meleah Woodbury our Adult Media Aide-- I have loved working in the School District in the past and am very excited to begin another adventure with the Washington County School District again working the best job ever. I did most of my growing in St George and am thrilled to be back living in Utah's Dixie. I am excited I can finally claim Dixie High as my team of choice and have been welcomed into the Dixie family with open arms. I look forward to many more great years to come. You think they are just sitting there at their desks all quiet and everything. They're like plotting the revolution man. I wouldn't mess with them.